ArtStack, one of the newest social platforms for the visual arts, is growing in popularity all over the word. 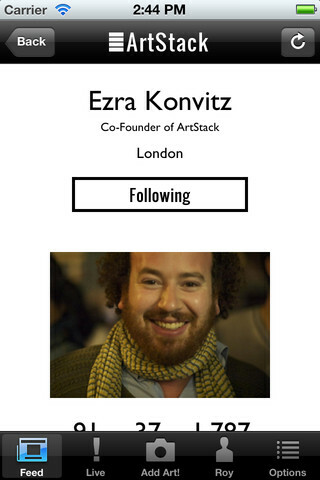 I spoke (Q) with Ezra Konvitz (K), co-founder of Artstack, to find out how it differentiates from other widely popular image-sharing platforms, such as Pinterest, and how arts professionals can benefit from it. ArtStack celebrates the process of discovering artwork in a truly empowering way for each user. But what makes ArtStack uniquely different from other platforms, like Pinterest, is the composition and intentions of its population. 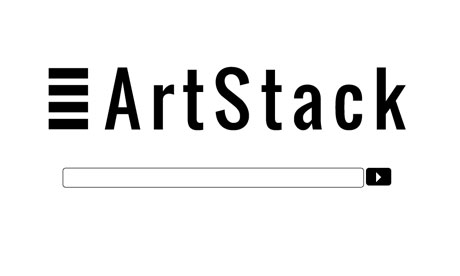 The ArtStack community is committed and focused on discovering, “stacking,” and circulating art. Read on for my conversation with Ezra Konvitz on the newest social platform for the visual arts. Q: “We believe the best way to discover art is through people” -- can you share how ArtStack was conceived and why the founders took this angle? K: We're a group of friends from university who were working in art and technology – we were lucky to be seeing incredible art every day, but we wanted an easy way to discover more art, remember works and share them with our friends. We originally built ArtStack for ourselves and our friends and we then we saw that there was a broad community who would find it really useful. People have always expressed their identity through the art they love, so giving people a way to share the art they like seemed really natural to us. We made ArtStack to give everyone the opportunity to showcase the art they like and to see the things their friends find interesting - and because there are so many art professionals using the site, you can also discover art through real experts. It’s like going to a museum and having your friends and a host of curators show you the art they like, then picking out your favourites and sharing a few things yourself that maybe they’ve never seen before. Q: Who founded ArtStack and who is involved? K: ArtStack is totally collaborative - there are three co-founders of the site (James Lindon and Alex Gezelius - we're old friends from university) and we have a team of developers working with us. We're refining and building the platform based on feedback from our users and what they tell us they want from the site. Q: In a sentence, how would you differentiate yourself from Pinterest? K: ArtStack is the social platform for art - the site's functionality, community and design are all built to showcase artwork and present the most relevant information about artists and their work. Q: How is artwork organized? How does one search for a painting? K: You can search for an artwork on the site by artist, title, or any keyword added to the artwork label (this could be the year the work was made, the gallery representing the artist, the collection the work is in, media, dimensions, etc.). You can also see everything that a user has added or stacked, and all the people who have stacked an individual artwork or are following an artist - ArtStack is both a social resource and a platform to organise the world's art. Q: What type of artwork is on ArtStack? Period? Medium? K: Anyone on ArtStack can add the artworks they like to the platform - so there are artists spanning every generation and medium. The site also supports YouTube and Vimeo links, so it's great for seeing video and performance art. Q: Who is using ArtStack? Is this the audience you envisioned? K: We have an exciting and growing global community including some of the world's most prominent artists, curators, collectors, museum directors, gallerists and also people who are passionate about art using the site. We're really happy with the community and delighted that people want to invite their friends to use the site. Q: How do gallery owners, arts managers and curators use ArtStack? K: Some of the world's most prominent curators, museum directors and gallerists use ArtStack to share artworks with the community, discover artists and organise works they find interesting. Our new iPhone app is really helpful for art professionals and art lovers who want to remember the works they see at galleries and art fairs - it means those images don't get mixed in with all your other photos and it's easy to quickly add information about the work right away to the photo so you can keep track of what you've seen and where. Plus you can share the art you're seeing immediately with your followers and the community. Q: What is the geographic reach of ArtStack? K: We have a growing group of people using the site from around the globe - there are people in China, India, Brazil and Russia on the site, and from all over the US, Europe, Latin America and the Middle East. They're really passionate about art and incredibly engaged with the platform. In fact, our users in China and Hong Kong can now choose to see the entire site in Chinese. Q: Is ArtStack at all motivated by sales, like Art.sy (which helps you discover art to buy)? K: ArtStack is designed as a way to discover and share art you find interesting - the site is based purely on finding art through people you know or who you think have great taste. Q: In Matthew Caines' article in the Guardian, he states ArtStack is the newest version of Web 2.0 -- Art 2.0. Can you talk about what makes ArtStack an engaging, participatory and interactive experience? K: Discovering a new work of art or an artist you've never come across is inspirational. We made the site so it's really easy to find artworks you've never seen before and to find artists you'll find interesting. Q: How does ArtStack get better with the more people who use it (the ‘Network Effect’ of Web 2.0)? K: As more people use ArtStack, the experience improves for everyone – the more of your friends and other people you find to follow are on the site, the more interesting art you see. And with a growing number of artworks being uploaded by users on the platform, more comments and more useful information being added by users to the artwork labels, ArtStack is already being used as a resource by art professionals. Q: How reliable is the information on the artwork, given the wiki and public editing format? K: People take great pride in their profiles and in adding accurate information about artworks to the site - users are also really vigilant about flagging when incorrect information is added about an artwork, so the information on the site is very reliable. We have a really art-savvy community using the site, so when people ask questions about a work they'll often get a response within minutes from the artist, curator, or another art professional. Q: How do users engage with one another? Is there a communication platform for users to interact beyond viewing each other’s stacks? K: Users can comment on works, respond to comments and send artworks to people who are following them. And, of course, you can add any artwork to your Stack that another person has uploaded. Q: Are there any privacy concerns for users? K: No - we don't share any user information with anyone. Q: How do you envision ArtStack in the future? What updates, new additions, and projects do you see down the line for ArtStack? K: We're adding new features every day based on feedback from our users - one exciting recent addition was the ability to curate collections from your Stack. We'll keep refining the site and the new iPhone app and developing new and better ways for people to discover and share art - we add new features to the site all the time! Q: We’ve featured digital art-discovering sites before, such as Art.sy, Artify It, and Paddle8. What is ArtStack's unique identifier, setting it apart from the rest? K: ArtStack is the social platform for art - we are the only site based around discovering art through people. Ready to start stacking artwork and following other stackers? At this time, ArtStack is an invitation-only beta. Interested individuals can join ArtStack and the art-sharing community by signing up here. P.S. As a new ArtStacker myself, I have to say, it is the most fun, visually captivating and addicting art-sharing site I have interacted with yet. Get stacking!